I remember as a child watching Carol’s show. She was so off-the-wall and yet in good taste. Her skits were hilarious. She made me laugh hysterically. At the time, I shared many of these moments with my parents and brothers, all watching television in the living room. I treasure those memories. Her trade mark, pulling on her ear, was unique. She truly is one-of-a-kind. Now, she wrote a new book. 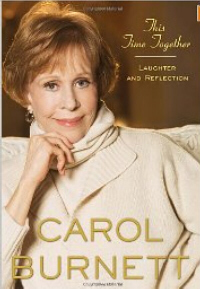 Carol is so personable that you cry when she cries and laugh when she laughs. As a result, I feel more connected to her … as if she were my friend. And that’s my thought of the week, what’s yours?